Max asked in a hushed voice: "Dad, do you know what the worst swear word of all is?" His son then went on to explain that "damn" must be the worst. When Bloom asked why, his son said, "I listen to my babysitter talk on the phone, and she uses the 'f' word, and the 's' word, but she never says 'damn!'" Editor reviews are provided by professional editors who evaluate a blog based on the following criteria: Frequency of Updates, Relevance of Content, Site Design, and Writing Style. Having famous cousins makes for interesting conversation but it "should not influence voters." Found this neat little iPhone/iPodTouch eBook reader called TextOnPhone. Over 25,000 books, including a decent catalog of recents and classics, all for free. They also have a Facebook App that emulates the iPhone experience on a desktop. Shameless plug: Guess which recent novel is included? Interesting standoff going on down in Florida right now. The Red Sox are threatening to boycott their season opener in Japan and not board their plane this evening upon finding out that the coaching staff will not be receiving a $40,000 travel stipend as previously promised by Major League Baseball. Gotta love and respect the players standing up for the coaches like this. I had planned a post at the conclusion of my epic 6 week jury duty, but then got so caught up in getting Timely Persuasion out the door that I never got around to it. Thought about scrapping it altogether since so much time had passed, but since I still get asked about it quite a bit I figured it was still worth blogging about for the record. I served as a juror on a toxic tort case for 6 weeks from January 2 through February 21. Plaintiff was a Caltrans worker who used to spray herbicides on the sides of the freeways. He did this in various capacities from the early 70s through the early 00s. One of the pesticides he used in the 70s was called Paraquat, which at the time was sold by Chevron. The man went on to develop pulmonary fibrosis and subsequently died, so his family was suing Chevron claiming that Paraquat caused his illness and death. Complicating matters, the plaintiff also had some other medical conditions that may or may not have played a role in his fibrosis, primarily something called GERD. This causes excessive heartburn and acid in the esophagus, which can theoretically lead to one inhaling small amounts of gastric juices and developing pulmonary fibrosis. Further complicating matters, the plaintiff sprayed Paraquat from about 1972-1979, then never used it again because the EPA made it a restricted use pesticide that required special training and licensing, so Caltrans decided to stop using it. He was perfectly healthy until at least 1987 and possibly 1997 (different experts interpreted his medical records differently) before developing the disease. The evidence showed that Paraquat is very toxic, but it tends to kill you quick or not at all. Linking this 15-25 year delay to the disease was the key question for us in the jury room. At this point, it'll probably be helpful for me to introduce the cast of characters via the power of the Internet (thus keeping this post somewhat on topic for the theme of our blog...). As a disclaimer before I start, keep in mind that the following analysis is just my opinion (and sometimes the opinions of my fellow jurors) based on our experience listening to these people firsthand or discussing it privately in the jury room after the fact. It should not be held up as "fact," only personal impressions based on a limited window of exposure. Had the same cast of characters been involved in a different case with different facts or different evidence, the opinions reached may have been different. Also note that I didn't view or even know of the existence of any of these websites until after the conclusion of the trial. Co-counsel for the plaintiff who tried a small portion of the case, though it seemed to come out during the trial that he was the primary attorney the first time around. The main point he was trying to get across in his questioning was that nobody knows if Paraquat can't cause fibrosis after such a long delay because nobody has ever done a study to investigate it. I agreed with that logic and that fact, but he also wanted us to then go in the opposite direction and say "because a study hasn't dis-proven it then it must be true" which I had trouble buying. Can't have it both ways. He was also the source of some unintentional comedy throughout the trial when his wife would loudly whisper questions for him to ask, pass him notes, or otherwise interrupt when he was speaking. Probably well intended, but as I told his partner when the trial was over it was extremely distracting and seemed to undermine his credibility. A few of us even saw the Court TV guy rolling his eyes and smirking while this was going on. 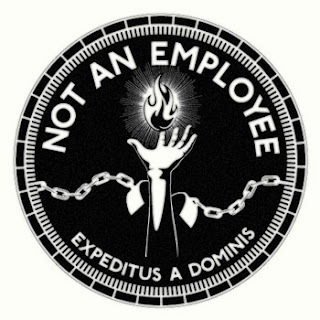 The benefit of the doubt side of me wants to say this was part of an act to play up the "David vs. Goliath" analogy of a worker vs. a big corporation, but I can't quite convince myself of that. Co-counsel for the plaintiff who tried the majority of the case for that side. Website is a heck of a lot classier, though the audiovisuals at the top are a little over the top, especially since I can't figure out how to turn off the sound. Website aside, this guy was just a dynamite lawyer. Passionate, energetic, smart, personable (with a little bit of a forgivable Eddie Haskell streak), and a heck of a lot of fun to watch in action. A lot of times (especially in his closing argument) he almost had me revved up and swayed onto his side, but when I took a step back and saw it was all heart and no substance logic prevailed. I would love to see what Stewart could do in a case where the evidence even slightly leaned towards his side, and if I or anyone I know is ever in the unfortunate position of having a legitimate toxic tort claim I'd recommend him in a heartbeat. Only criticism I have is that he always made a big deal about how much money expert witnesses were being paid for their testimony, when from my perspective this was a little hypocritical since he came across as a hired gun for the retrial and was probably earning a comparable if not greater fee for his expert lawyering. Primary counsel for the defense; tried virtually the whole case by himself. Another great lawyer. Seemed like a respectable, stand-up guy throughout. He was big on facts and getting the science explained which was helpful to the jury. Putting him head to head with Stewart was interesting, as it played up the "Lost" themes of man of science vs. man of faith. Similar to what I said about Stewart, I'd be very interested to see what Riff would do in a case where the evidence wasn't in his favor. Would he still be a likable, stand-up guy, or would he play dirty and give me a different opinion? I'll probably never know. I can't really comment too much on his website since it's the site for his corporate firm and not him as an individual, but I do really like his little essay on defending toxic tort cases toward the end of the page. Going with my concern on what he'd do in a different case, reading this after the fact put me at ease that my perception was the real deal and I hadn't been conned or taken. Plaintiff's expert. Brilliant man. Likable and well spoken. Comes across as a touch arrogant at times since he was so confident and self assured in his opinions. Only problem was he didn't really back up any of his testimony with evidence or studies, though this may not have been his fault as most of the studies referenced were not admitted into evidence by the judge anyways. Plaintiff's expert. One of the few things the jury unanimously agreed on was that this guy was a terrible witness. There were at least three different times where Stewart asked him a softball of a question and he answered in the opposite as to how you expected, which led to "Are you sure about that? Let me repeat the question.." after which he'd quickly change course. It was almost like he was caught not paying attention while in the witness chair. Defense expert. I liked this guy, but a lot of the jurors thought he crumbled under cross examination. I agree he was less elegant under cross, but my interpretation was he was being asked vague questions and being forced into an "only answer yes or no" game that he just didn't want to play. I found it interesting how it came out during witness questioning that many of the witnesses and lawyers have crossed paths before in previous cases. Made me wonder why they didn't anticipate some of the questions/tactics that would be used on them and take the time to anticipate how to answer them. You'd think it would be more of a chess match and less "I don't recall." Defense expert. Another really smart guy. The jury put him toe to toe against Crystal and they came out more or less at a draw, putting enough doubt in each others opinions in an "agree to disagree" sort of way. Unlike King, he came out swinging in cross examination with a stern yet professional push to give full answers that went over fairly well. Defense expert, and primary proponent of the GERD/Fibrosis connection and theory. What I liked most about this guy was that he was honest enough to say "My theory has not been proven to scientific certainty. Everyone agrees there is something there and it warrants more research. Some support it, some don't. But I believe it, and I'm going to prove it one day." This was quite refreshing after so many other witnesses on both sides would say "I'm right, everyone else is wrong" to have someone give an honest answer that acknowledges the gray area. The plaintiff's lawyers worked so hard during the trial to write off this GERD theory as made up pseudo-science that it became an important part of the case. In the end a number of us felt that we were being asked to choose one unproven theory (GERD + Aspiration = Pulmonary Fibrosis) vs. another unproven theory (Paraquat + a long, slow smoldering effect on the lung = Pulmonary Fibrosis decades later). Given that choice, the only viable answer was "not enough info on either, could be one or the other, not proven either way." I about fell out of my chair when I saw that the first time around the plaintiff sued over 40 different companies, seemingly Caltrans and the manufacturer of every chemical they ever used. It also appears that everyone settled out of court except for Chevron. Finding this both solidified my feeling that we reached the right verdict, and made me lose a little faith in our legal system that such a blatant abuse of the system would be allowed to occur. At least it answered one pressing question I and several other jurors had during the trial: Why aren't they suing Caltrans, as it would have been a slam dunk. Thus concludes the short version of my experience and the longest ever Towform post. Remember, it's just one man's opinion and thought process during and after his jury service. Happy to answer questions in the comments if any. ...While lighting bills were reduced, air-conditioning units had to run more often, because people were home on hot afternoons when they'd otherwise be still at the office. Heaters had to be run on cool mornings, too, when people got up and it was still dark outside. Professor Matthew Kotchen, who pioneered the study, noted, "I've never had a paper with such a clear and unambiguous finding as this." Ever wonder what would happen if you ran your iPhone stopwatch for 41 days and almost 16 hours? I was at a dinner last night, and a fellow mentioned that he'd been in Echo Park a few weeks ago where there was a new "time travel" store. 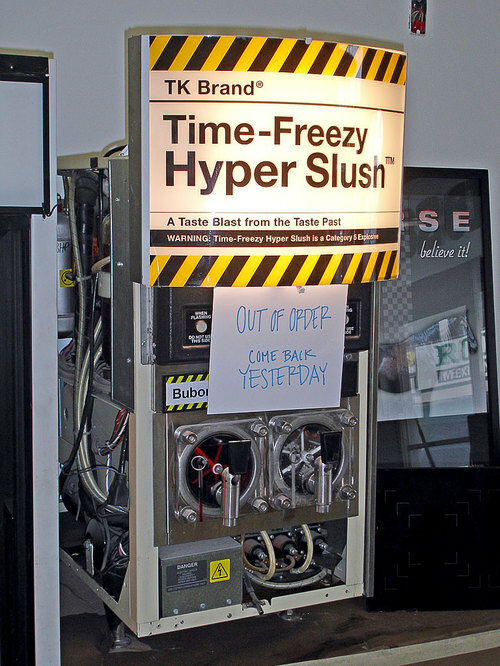 My favorite item was the Time-Freezy Hyper Slush. Escaped the office, the factory, the regimen, the rat race, the vultures and that goddamned rock. And all the more, we collaborate. "Please go to the following URL..."